Poet Ko Un is to leave Suwon amid sexual harassment allegations surrounding him and complaints over the city’s use of public funds to support him. Suspicions of sexual harassment arose when a female writer wrote a poem, explaining that the story came from her own experience of being sexually harassed. The unidentified character’s details matched that of the poet Ko, although she has not confirmed it was him. He has not responded to the accusations. 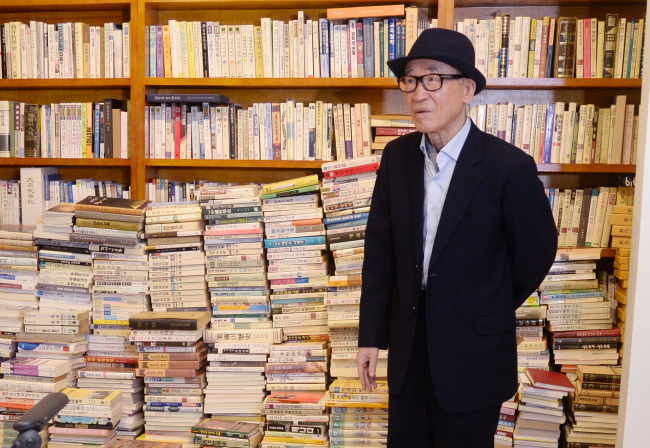 The poet has been living in Suwon, Gyeonggi Province, for the past five years after the city government arranged a house for him, in a move to encourage its development into a city of humanities. Ko has used the house, situated beside a mountain, as a home and a writing studio. An official from Suwon City announced Sunday that the Ko Un Foundation had conveyed the poet’s intention to move to a different area. According to the statement, Ko Un decided to move to “not be a burden” to the city. Residents in the region protested last May that it was unfair for the city government to support the poet while they have been financially suffering from the region being designated as an environmental protection area. The city government had purchased and remodeled the house for the poet, who has been regularly tipped for the Nobel Prize for literature. It has been paying the maintenance cost for the house as well. Local women’s rights groups protested against the city government recently to stop its support for the poet, after he was accused of sexually abusing another writer.